BMW highlighted its reputation for automotive performance, heritage, creative flair and style by debuting one of its famous Art Cars at Art Dubai. Art Dubai which was held from 20-23 March is one of the leading art fairs in the region and is billed as the leading platform for Contemporary and Modern art from the MENASA region. The car that BMW chose to launch at the event was a stunning BMW M3 Group A Race Version Art Car. It is the 8th such car in BMW’s long-running Art Car series and was created by Australian artist Ken Done. The 1989 BMW M3 celebrated its 30th anniversary at the art fair and stunned all visitors to the event with its creative look. The car sported Done’s powerful brush strokes and bright colors which symbolized modern Australia which is known for its sunny beaches and semi-tropical landscapes. The body of the car had an abstract portrayal of parrots and parrot fish as Ken Done saw a strong affinity between them and the BMW M3. The outcome of Done’s work is a car that represents speed and beauty in Done’s unmistakably Australian style. 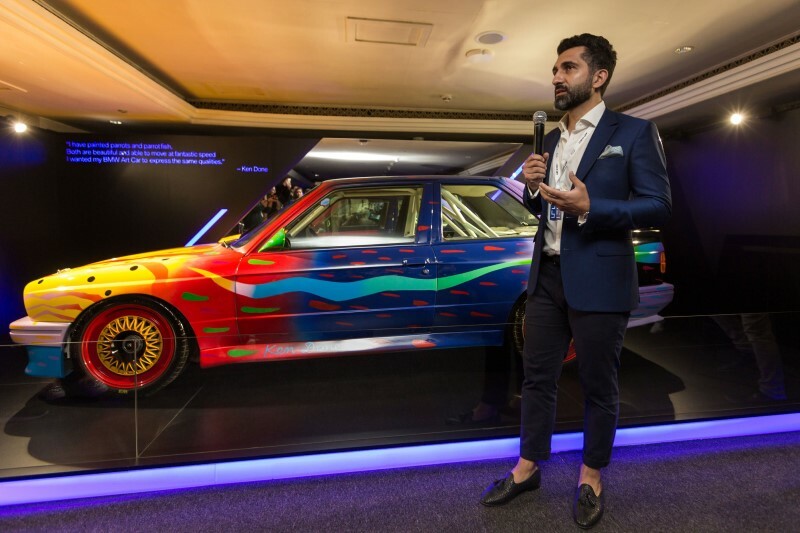 Commenting on the car, Dr. Hamid Haqparwar, Managing Director BMW Group Middle East, said that it was a great honor for BMW to use Art Dubai to celebrate the 30th anniversary of Ken Done’s Art Car. The BMW M3 Group A Race Version highly impressed all visitors to show who loved both contemporary art and classic vehicles. Dr. Haqparwar said that BMW plans to bring more cars from the BMW Art Car Collection to the region as the cars denote a wonderful collaboration between two worlds that share many key elements like artistic expression, imagination and inventiveness. Prof. Dr. Thomas Girst, Global Head of Cultural Engagement at BMW Group offered a more interesting take on the history of the BMW Art Car Collection saying that BMW has a long history of collaborations and partnerships with really talented artists. The BMW Art Car project is just one example of how there has been dialogue between two areas of work both of which require creativity. Ken Done, with his unique interpretation of the BMW Art Car, managed to successfully create one of the most stunning vehicles in the long-running series. The car was definitely a great addition to the 2019 edition of Art Dubai and was well received by visitors to the show who were intrigued to hear the fascinating story behind the creation of the car and the motives and inspirations of the artist. The BMW Art Car was not the only vehicle displayed as part of the collaboration between BMW Group Middle East and AGMC at Art Dubai. The BMW area also featured the all-new BMW X7 which sets a new benchmark in luxury and offers the flexibility and excitement of a Sports Activity Vehicle (SAV) in addition to the presence, exclusivity and spaciousness of a luxury car. Pablo del Val, Artistic Director of Art Dubai said that BMW’s Art Car Project, which goes back 40+ in terms of the company’s collaboration with the leading artists of the world is a prime example of BMW’s cultural commitment. It definitely served to enrich the experience of visitors to Art Dubai. BMW’s three-year partnership with Art Dubai, in collaboration with its distributor, AGMC, is one of BMW’s latest initiatives in the company’s long-term arts and cultural engagement. As part of this initiative, BMW has been collaborating with many such initiatives across the globe in the fields of jazz and classical music, modern and contemporary art, as well as architecture and design for over 50 years.